As you visit all the show notes below, you'll find the vast majority of the links are broken. For the most part, that comes from the sheer age of the links and the fact that many of the linked record labels or other music sources are defunct. 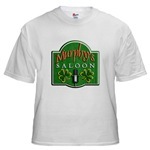 But I've always thought of Murphy's Saloon listeners as a resourceful bunch, so if you hear an artist you like, I'm sure you can hunt them down.